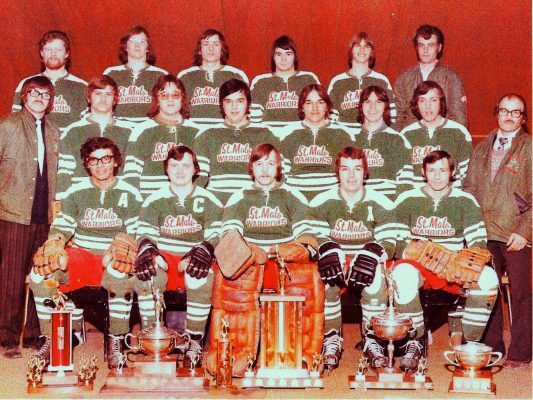 The intermediate Hanover - Tache Hockey League was established in January 1958 to provide an outlet for local players from smaller communities in southeastern Manitoba. Six teams played in the initial season and St. Malo entered a team for the first time in 1963-64. In 1970-71, the Warriors finished first in the league's south division, but lost to Mitchell in the semi-finals. The following season the third-place Warriors defeated the first place Mohawks in the semis, but then lost to the eventual champion Grunthal Red Wings. In 1972-73 it all came together for the youthful St. Malo team. The Warriors went through the regular season undefeated winning 18 straight games. They then capped off a perfect year by winning eight more in the playoffs and the team's first Hanover - Tache title.